The very fact that the senator took the test was not merely a concession to the wiles of such rogue, extortionate agencies such as “Ancestry.com” but a nod to the validity of Trump’s characteristic prodding. He had managed to, as he has so often before, lower the tone of conversation and disfigure it. Warren had, in other words, done what most Democrats did before and after the election on 2016: grudgingly accept that the man wasn’t barking mad or reactionary in insisting on a course of action reserved for game show gimmicks and the lunatic fringe. The test-run of this spectacle was already made during the previous presidency, when Trump repeatedly insisted that Barack Obama was born, not in Hawaii but Kenya. Obama assumed that a world of debate, evidence and tests would matter. The fact-checkers would gather under the same umbrella; confidence would be restored against ignorance and the ill-informed if the paperwork could be produced. Against the mind of Trump, facts have no place to land, no means of clutching and holding. They simply slip, awaiting the next grab. More often than not, they are subtracted. Taking such tests, larding counter-claims with weapons of putative fact, simply plays into the pantomime of provocation and mockery that Trumpland inspires; you dignify such shows of provocation further by conceding to your opponent that he might have had something to go on in the first place, the absurd or irrelevant rendered plausible. Unfortunately for Warren, her effort to placate the hounds of scepticism did not only inspire Trump to another round of mockery; it enraged members of the Cherokee Nation. Warren had issued a modest disclaimer in saying that, “DNA & family history has nothing to do with tribal affiliation or citizenship, which is determined only – only – by Tribal Nations.” While respecting “the distinction”, she preferred to not list herself as “Native” in the Senate. The way was left open to Trump to initiate another round of attacks. 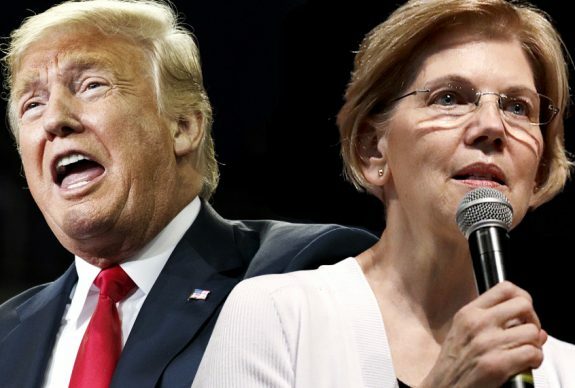 “Even they,” chortled Trump, “don’t want her.” He thanked “the Cherokee Nation for revealing that Elizabeth Warren, sometimes referred to as Pocahontas, is a complete and total Fraud!” And so it was, back to the misery of square one, Warren checkmated, Trump bullishly ecstatic, and political conversation dumbed into oblivion. The mile being his ego, the inch being his???????? Thumb? ….. tiny hands …. You can’t reason with stupid. He needs to be ignored. As the article says in July Trump said -. ” Who cares? I didn’t say that. You’d better read it again”. So, no surprises there. Business as usual. Confusing article. So it’s Warren’s fault Trump is an idiot? Why did the Cherokee Nation get involved? She wasn’t claiming any affiliation? This piece just seems like another normalisation of his behaviour at her expense. Anyone who is not a Trump supporter would accept this for what it was, another example of Trump’s bullying misogyny. If Warren hadn’t taken the test Trump would never let it go. This way if he raises it again, as he inevitably will, there is an answer, as there was with the Bircher movement. Trump and his band of merry maddies will continue in their insane beliefs but at least those who think will know the reality. The Cherokee intervention was not helpful. Trump does not like the Me Too movement; for him there’s only ME…! Yes, God bless Elizabeth Warren. to that extent was a bridge too far. What Trump really needs to discuss is whether he had prior warning of the Khashoggi ambush and why he appears not to have directed US intelligence to prevent the crime by warning off Khashoggi, perhaps through an intermediary. Did Trump have something to gain through the death of a skeptical journalist with an intimate understanding of how Saudi Arabia works?